In this blog we explain why upper house MP, James Purcell, has copped our wrath – and why we think he needs to follow Police Minister, Lisa Neville, into retirement. 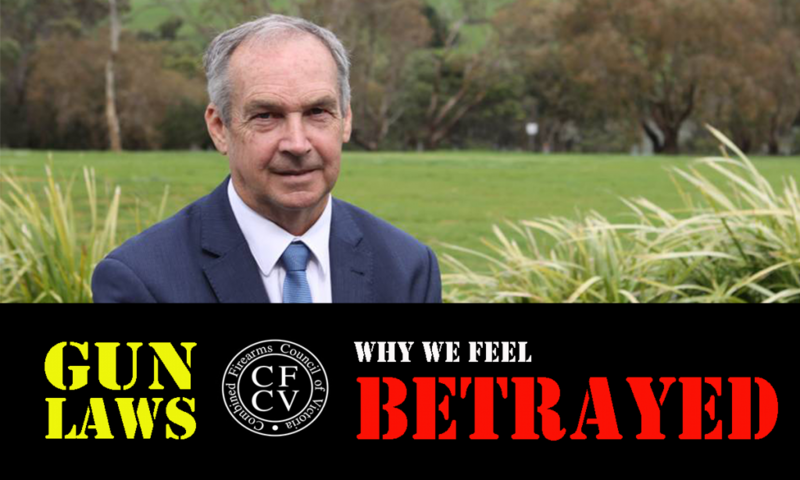 Prior to the last state election, a minor party which had the strong support of the CFCV, helped James get elected to the Western Victoria Region through the allocation of preferences. In the many conversations I had with [James] prior to his election he did strike me as someone whose word could be trusted and who would [be appreciative of] the support of the shooting community. It’s possible James might have got elected without our involvement. However, from a timing perspective, our involvement proved to be valuable. The preferences we helped organise knocked the Animal Justice Party out of the running for that last spot in that upper house area, which James ultimately won. It was a good result for everyone concerned, and we never asked for anything in return from James. However knew we could call on him if we needed to: that’s how politics works. Late last year, three members of our executive visited James at Parliament House to seek his support for amendments to the Firearm Prohibition Order (FPO) regime. While James could not make any firm commitment, he could see the sense in what we were seeking. He even offered to take any amendments we come up with to the government to help get them through. As our meeting came to a close, he said to the three of us something along the lines of “… I do owe you a favour”. Not that we expected James to say it, but it was a welcome sign that he was going to help us where he could. At the very least, he was going to deal with us in good faith. After meetings with many, many MPs, the opposition moved amendments to the legislation when it went to the upper house. By that time, we had the 21 votes (out of 40) we needed to get them up. We “had the numbers” in what was going to be an important political win for shooters. It stood to be a win which would challenge the untenably close relationship the police has with our government, which compromises its ability to be the impartial regulator it claims to be. The government went feral. You will recall our last post about the way our police minister, Lisa Neville, carried on. She issued media releases about mobsters, lobsters and her views about the leader of the opposition. Not once did she acknowledge any of the legitimate concerns Victoria’s shooting community had about the legislation. Just before the amendments went to the vote, we asked James if he needed any further information in the lead up to the vote. His response to us was that he would “give [us] a call if any queries”, which we took as a sign that his dealings with us in good faith endured. Then, without explanation, he voted with the government. This locked the vote at 20-20 which meant they were not passed. We did well, but not well enough. Quite simple. I met with a large number of groups (including yourself), discussed with government/opposition/most other parties and everyone else who had an opinion. After considering everything put to me I wasn’t convinced that the amendments improved the bill. Unfortunately decision that are made in parliament never please everyone but be assured that all my decisions are made independently as I don’t have an affiliation with any groups and I don’t accept a cent of funding for my myself or my party. We’re stunned. Surely ensuring something like appeal rights to the magistrate’s court was improving the bill. Surely he owes the very people who helped him and who he offered support to, a better explanation. Governments which need favours to support their legislative programs often offer something in return. We’ve seen them do that with the Greens, the famous stand off by the Democrats over the GST laws to see food get exempted, and Tasmanian Senator, Brian Harradine who scored hundreds of millions of dollars for local programs during the sale of Telstra. That’s politics; no-one gives their political capital away for free. The government knew the CFCV had the numbers to get the amendments through. They also knew winning this fight would have been a severe and public embarrassment to them, especially when the opposition has the government on the ropes over law and order. They were desperate for a win and had to do whatever it took to get someone to change their vote – which meant they had to delay the bill, even if it took another one, two or six months. Whether or not something was ever offered for his electorate, we will never know (and are not suggesting). All we can say with any certainty is that something caused James to go from being a friend, to voting with the government – and that his explanation for doing so is far from convincing. It would be wise for James and indeed all politicians to remember the trust is a currency you can only spend once. On the basis of the above it would seem that James’ purse is now empty. Who does James need to look after? James’ constituency is his electorate, which is Western Victoria. The lower house seat area where he is located (South West Coast) includes the towns of : Allansford, Bushfield, Cape Bridgewater, Caramut, Condah, Dennington, Hawkesdale, Heywood, Kirkstall, Koroit, Macarthur, Nelson, Panmure, Port Fairy, Portland, Tyrendarra, Warrnambool, Winslow, Woodford, Woolsthorpe and Yambuk. James is a former local mayor of the Moyne Shire Council. As the local upper house MP, he has had some good wins for his local community. However we think this outcome is an exception. The grounds for issuing a FPO on someone include their ‘behaviour’. The legislation does not define what type of behaviour it covers, and police have issued no guidelines. There are no criteria. This means it is up to each local officer to make up their own mind on how the law should be applied. It means they can apply orders to anyone, for any reason. Having a FPO means you cannot visit your local gun club or visit friends who would normally have firearms stored there. If you live in a rural area, odds are you will not be able to go to your neighbour’s house – even if there are no firearms there at the time of your visit. You can’t go to a paintball range or gun shop. If you do, you can expect to go to jail for the next year, even if you have done nothing else wrong. You will have no right of appeal to a magistrate’s court, and the next 10 years of your life will be hell – and remember, the police have no policies or procedures to guide them. These laws aren’t about criminals, drive-by shootings or bikies; they’re about giving the police the power to target anyone for any reason, even if they have no interest in firearms. This is what James voted for. If you are a local, then why not make a time to see him? Let him know what you think about this decision – but make sure you are calm and stick to the facts. His office in Port Fairy is open on Tuesdays and Fridays and can be contacted on 5568 2929. The CFCV’s main interest this year it to make sure the election process works for shooters. This includes ending the careers of politicians who do us harm. James has done us a lot of harm. STOP PRESS: the day this story was published, the Standard in Warrnambool reported that James has decided he will contest this year’s election, probably in the lower house seat of South West Coast. To win this, he’ll probably need Labor preferences ……. Missed our earlier blog on Lisa Neville’s frantic attack on the amendments? Click here to see it. James is a politician,by their very nature they are pathological liars. Robert Ringer wrote a book called “looking after number 1” James is a number 2.No surprises here folks.There will after all be no carbon tax under my government. He certainly felt comfortable not supporting regional jobs when he backed the Govt in the Domestic Animal Bill. I agree with Kim, Politicians are indeed pathological liars and they lie at every opportunity, however i do feel for the likes of Jeff Bourman, Dan young and Bridget McKenzie who have been nothing short of exemplary toward our cause.